We will be using the pepper-mint marinade recipe outlined in yesterdays post in the 50 day nightshade recipe challenge. Feel free to add other vegetables to this recipe such as mushrooms or chunky onions to add more crunch and taste or to make your limited meat supply last longer. Prepare the Pepper-Mint Dressing. Set out a 9 x 13-inch or 10 x 14-inch glass baking dish for marinating the kebobs. Alternate the chunks of chicken and zucchini rounds onto the bamboo skewers. Place skewers into the glass pan and pour the mint marinade over them. Turn them a few times to coat evenly. Cover, refrigerate, and let marinate for 30 minutes to 4 hours. Heat your grill to medium-high. Cook for 10 to 15 minutes, turning two or three times during cooking. 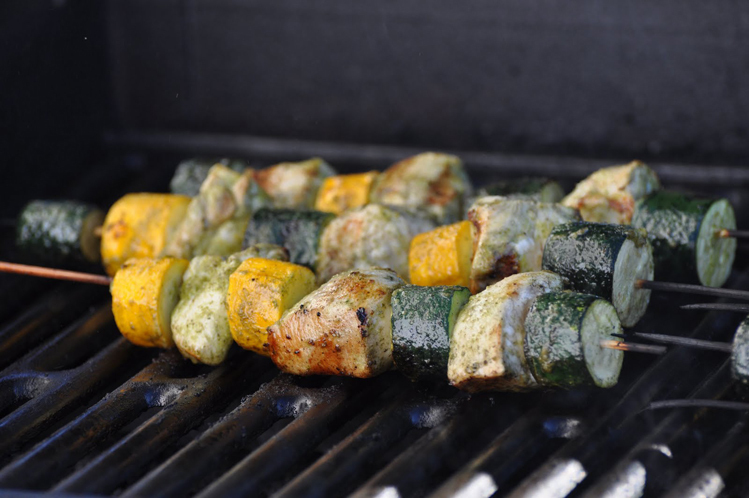 Many thanks to nourishing foods for this great BBQ recipe.